The trick is not to work out to the point where you break a sweat. Just do a few sets every now and then to keep your body moving and add to your existing workout program (if you have one). Over time, it makes a difference. This approach is also great when you have a tough schedule that makes it tough to get to the gym often. Pump a little iron between meetings, and you’ll bring at least a little bit of healthy living into your routine. 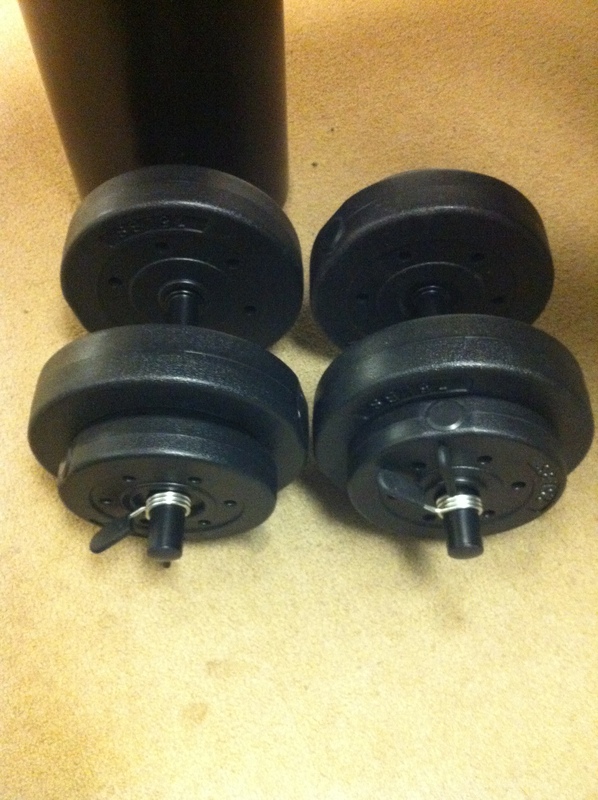 This weight set, which I picked up on Amazon for around $30, has two bars, two 7.5 lb plates and two 2.5 lb plates. I’ve been able to get up to 30 lbs on one bar, and I think I could get another 2.5 lb plate on each side (bringing it up to 35 lbs). I doubt I’d be able to get 40 lbs onto one bar. Needless to say, 30 lbs is good enough for a conference call. Now, what are you going to eat after that?